is to access the creative energies of it's members and create an open, collaborative creative event, in a venue accessible to all who want to participate --- to share flamenco with everybody, not only those who want to perform on stage, but those who come to share in that process as active spectators. Indeed we all know that this is a labor of love--- us volunteering our dance time, our thoughts, our process; and in the end-- getting something wonderful out of it. Misión Flamenca is looking forward to sharing the stage with very special local Bay Area artists. Our guest artists this month are Damien Alvarez al baile, Roberto Zamora al cante, and Bill Burgess on guitar with the usual Misión Flamenca dancers, Gina y Lea. This month we are also welcoming guest cuadro dancer Vida Felsenfeld with her husband and cuadro guest guitarist Peter Felsenfled to the stage. 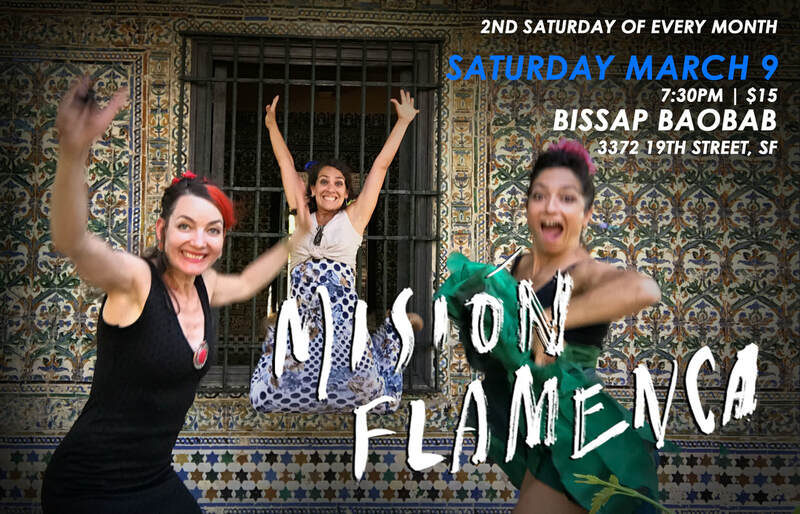 Come join us for an intimate flamenco performance at Bissap Baobab this Saturday, March 9th. Book your evening with a ticket to the show and dinner, show starts at 7:30pm. We invite everyone toparticipate in our buleria fin de fiesta at the end of the show. Stay and let your hair down to dance to Bissap's awesome club music after the show.